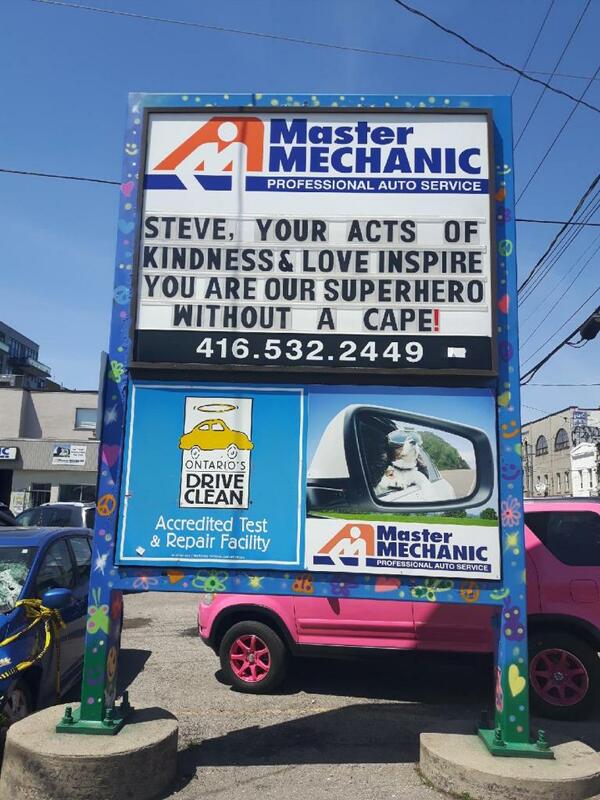 Master Mechanic High Park: Surprising Steve! 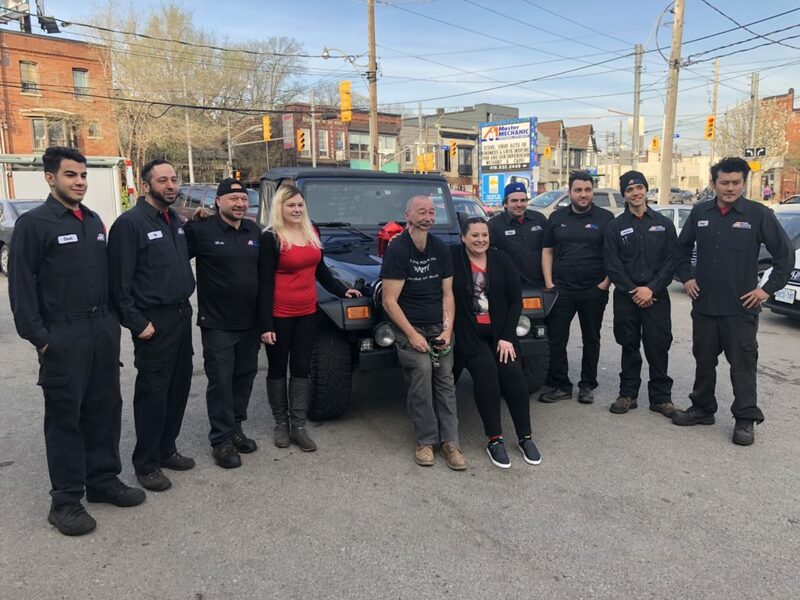 Master Mechanic High Park, local businesses and the community rally together to surprise a beloved cancer survivor with $8,000 in desperately needed car repairs. Steve Manderla has been a friendly face in the High Park community for a very long time. Anyone with a pup who frequents High Park or Sorauren Park has seen Steve and the immense love he has for the dogs he walks and owns. He was diagnosed with bone cancer in his jaw and the impact it left on his life is clear. After undergoing chemo & radiation therapy that almost took his life, he was left with a difficult decision to make. With a low chance of survival, he underwent surgery to have his jaw, tongue and other cancerous tissue removed to save his life. The road to recovery was long & challenging for Steve, and before long, he was also diagnosed with a life-threatening heart condition. Having to undergo immediate triple bypass surgery, he once again beat the odds and survived. Steve emerged with his sense of humour, kindness, and adoration of dogs fully-intact. Unbeknownst to him, he also became an inspiration to the community. Prior to his deteriorating health condition, Steve was employed with the TTC. Now on long-term disability, he walks dogs to make ends meet. He relied on his Jeep Wrangler to pick up and transport his clientele. That was until recently, when the rear differential gears broke, on top of many safety related repairs needed, which left him unable to get around. Without the money to have it fixed, his earning power and productivity hit a big roadblock. Rallying the community, local residents, Denise Sandler & Corrine Ann, created a Go-Fund-Me Page to begin raising $10,000 towards fixing the truck. About half-way to reaching their goal, they reached out to Master Mechanic High Park to repair the Jeep. After hearing his story, and finding out he was facing eviction from being 3 months overdue on rent, Owners Josie Candito, Rui Silvestre and Mike Tavares decided they couldn’t possibly accept the money. Over the last month, the Master Mechanic High Park team completed the repairs for free, by working after hours to get it done! They worked closely with other generous businesses to make this happen: Napa Auto Parts on Benton Road generously donated ALL of the parts needed for the repairs. Manny’s Auto Trim replaced the windshield. Mr. Transmission Richmond Hill rebuilt the rear-differential which the Master Mechanic High Park team installed. Classique Auto Spa fully detailed the Jeep. Mobil donated $200 in Esso Gas cards to help Steve get around. 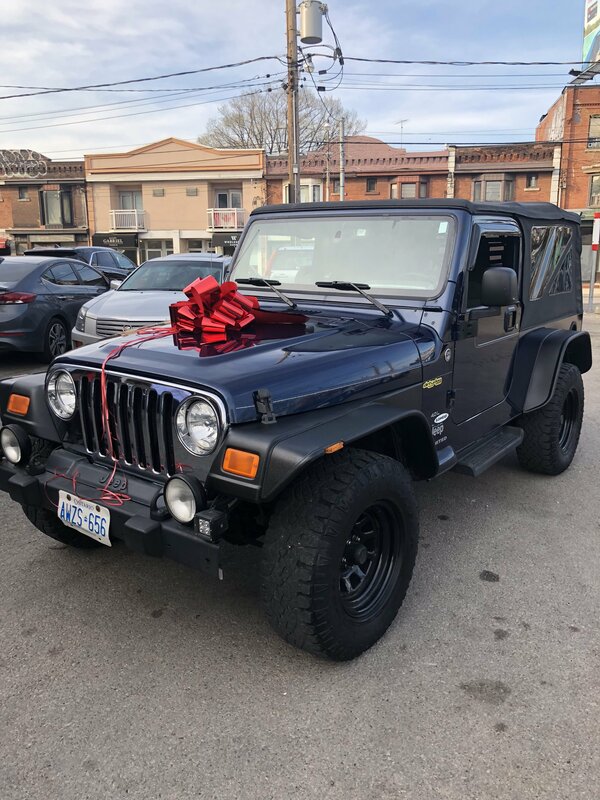 Custom Coaches provided essential body repair products, so the Master Mechanic High Park staff could complete the repairs. 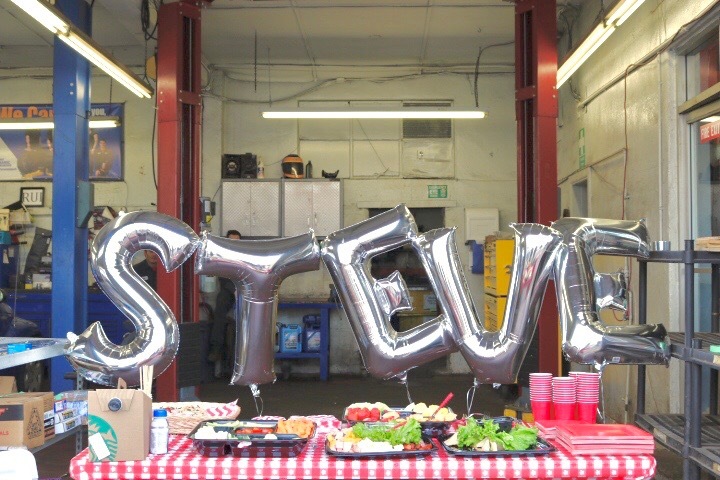 Knowing that dogs are so near to his heart, Master Mechanic also prepared doggy gift bags for Steve’s pups, and a bag of Benny Bullies for Steve to share with our pawesome community dogs when he is out walking them at the parks! The Master Mechanic High Park staff and Master Mechanic Head Office have also purchased a $500 Visa for any other expenses he may have, like renewing his license plate sticker. 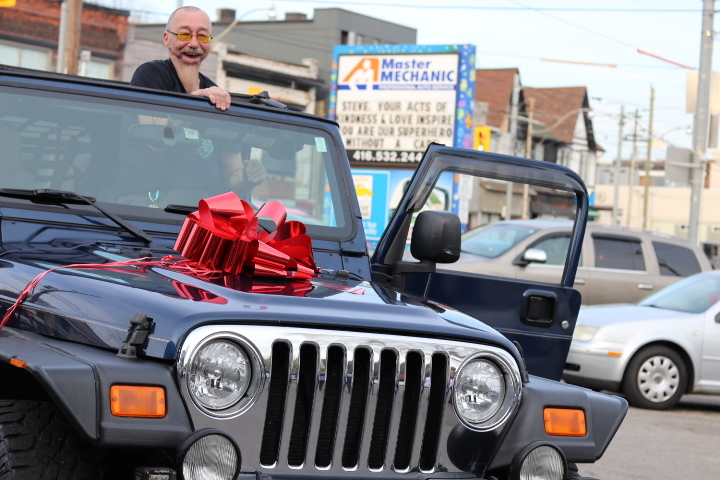 All the gracious donors showed up to surprise Steve with his fully repaired Jeep at Master Mechanic High Park on May 9th. Wrapped with a BIG red bow and ready to hit the road, he couldn’t have been happier! “Now I remember why I bought it!” exclaimed Steve, while revving the engine. Wishing you all the best, Steve! Happy driving!